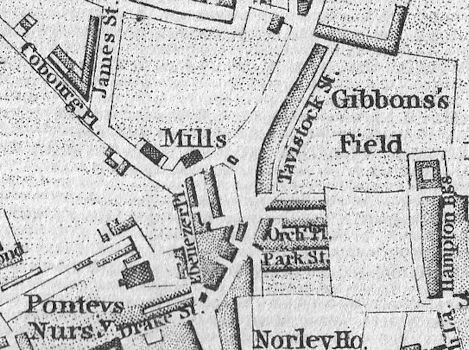 What became Cobourg Street was originally Cobourg Place, as can be seen from this extract from John Cooke's map of the Borough of Plymouth published in 1820. Cobourg Street used to run from the junction with Saltash Street, Pound Street and Rowe Street westwards to Boon's Place and Belle Vue Terrace at the crossroads with North Road. It should be mentioned that the land upon which Cobourg Street stands was outside the Borough Wall until it was removed at the beginning of the 19th century. Today (2019) it is the main road linking the junction with Tavistock Road, outside the City of Plymouth Museum and Art Gallery building, to North Cross roundabout and includes the stretch that used to be Pound Street. Her Royal Highness the Princess Charlotte, the only child of His Majesty King George IV, married Prince Leopold of Saxe-Coburg in 1816. Both were very popular and the death during childbirth of the Princess in 1817 was seen as a national disaster. The name Cobourg Street first appears on a map of Plymouth in 1827. At the Five Fields Lane (North Road) end were Gloucester Place and Bellevue Place. Principal buildings in Cobourg Street were the Cobourg Street Primitive Methodist Chapel, the Plymouth Register Office (after the Second World War) and the Plymouth Public Free Schools for Boys and Girls. Plans were announced on July 2nd 1931 to place a bus station on the land to the south of Cobourg Street. It never materialized. On June 13th 1936 OD 7811, an omnibus owned by the Western National Omnibus Company Limited, crashed in to private car BUU 499 and then into a house in Cobourg Street. During January or early February 1945 the members of the City Council's Reconstruction Committee viewed the vista over Plymouth Hoe from the top of the garage premises belonging to Messrs Reeds' (Plymouth) Limited. The Nissen Huts that had been erected in Cobourg Lane and Richmond after the end of the War were removed during November 1956. For a list of the occupants of Cobourg Street, Gloucester Place and Bellevue Place in 1852 CLICK HERE. For a list of the occupants of Cobourg Street and Belle Vue Place in 1953 CLICK HERE.